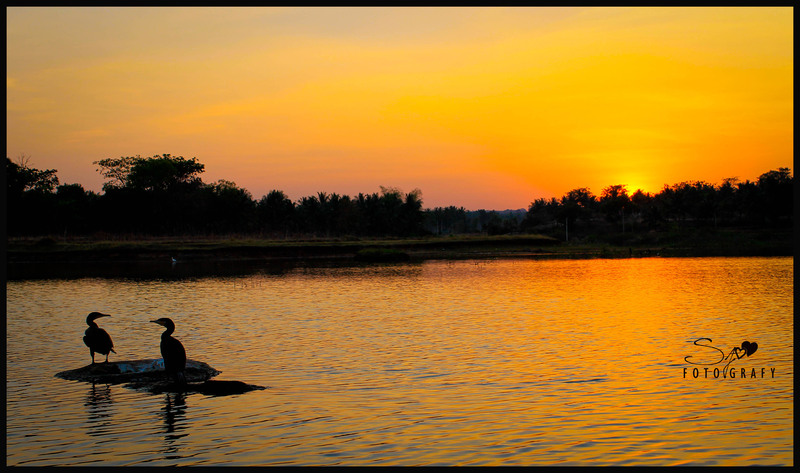 Couple of days ago while surfing through a blog, I happened to stumble across some brilliant sun set pictures by a water body. 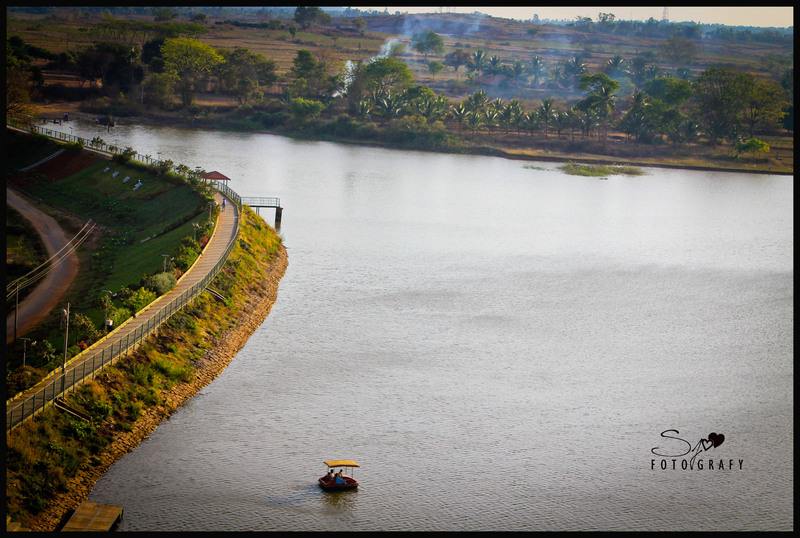 More interesting was it said to have been clicked at Ramanagara, around 40kms from Bangalore. I was bewildered! This beauty of a phenomenon at Ramanagara? Could never imagine something of this sort in a little town known for its silk cocoon farming. We had a long pending bike-ride and without second thought we zeroed in on this particular lake. After exchanging couple of messages with the blogger, we collected the details and on a sunny, bright Saturday afternoon we were again on the Mysore road, riding our bikes to this never-heard-before place called Panchavati. Panchavati, the name gets mentioned in the epic Ramayana during the Vana Vaasa – exile in the forest – of Ram-Laxman and Seeta. The place where they stayed in the forest, a peacefully scenic landscape within the forest was named Panchavati according to the legend. But this Panchavati in Ramanagara has got nothing to do with the one mentioned in Ramayana. Historians already claim that the actual Panchavati is in the northern state of Maharashtra. So all in all, without knowing what exactly was in store to us, we cruised along the less crowded Mysore road. There’s one particular thing I love about being away from Bangalore. The people suddenly become extremely sweet and generous to you unlike few Bangaloreans, no offence. The auto drivers, road side vendors, pedestrians, villagers most of them are kind and helpful. I am forced to write this because of two people, the first person, a tender coconut vendor lady by the road near Ramanagara. We stopped our bikes near this tender coconut vendor enquiring for Panchavati Lake. The lady there never seemed to have heard of this name Panchavati. But she told us all that she knew! There’s a beautiful lake around 2kms from here! They even have boating. It’s a very nice place. You would spot a huge rock and go alongside, that will take you there. Apart from that I am not aware of any lake in the vicinity! She was concerned and warned us about the swirls and deep waters, asking us to keep away from waters like a mom would tell her son! Given that she was selling tender coconuts for her livelihood, she could have compelled us to buy one, which would have been certain if this took place in Bangalore, but she was keener on explaining us how good the place is and how careful we got to be while being there! Some humanity that you do not get to see often! We rode past the traffic signal in Ramanagara and went until we found the diversion. The narrow road, which cuts through fields, goes straight unto the foot of a huge single rock which is a part of the rocky mountains that stretched beyond it. As we approached, we could see the lawn constructed on a slope which seemed like a compound to something. It was certain, there was a lake beyond. We parked our bikes and headed towards the gate. There were really huge rocks beside the gate that stretched into the skies. Some of the rocks seemed to be balancing on the other, very precariously. Nobody would know since how long these rocks would be playing the see-saw kind of game. It had withstood the speedy winds, uncertain climatic changes and continued to stand still over the years. 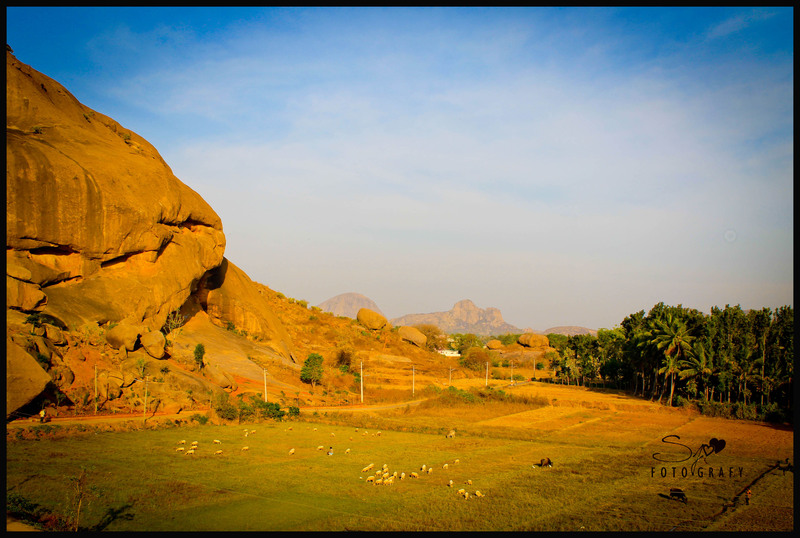 This particular region in Karnataka is a part of the world’s oldest granite hills. These hills around Ramanagara have made their way into silver screen through movie like a passage to India and bollywood blockbuster Sholay. These hills are believed to contain huge amount of iron-manganese ores in them. Adjacent to the hills, on the other side of the road was a green field in which a shepherd was grazing his flock. Picture perfect indeed!!! Unable to contain the excitement to see a water body in such a setting, we climbed the steps of the sloped compound wall; there it was finally, Panchavati Lake, a moderately vast lake that starts right from the edges of the humongous rock mountain (?) on the east and stretches over 200 Mtrs into the west and more wider in width! The taluk administration has constructed a fenced walk way along the southern bund of the lake that stretches all along the lake from east to west. Here I met the second person who concreted my love towards these people outside Bangalore. He introduced himself as Siddaraju. A very kind, innocent, young villager, Siddaraju gave us more information about the place than probably anybody could. Raju grew on the banks of this lake and had seen the place transform from his childhood play area into a tourist spot very recently. 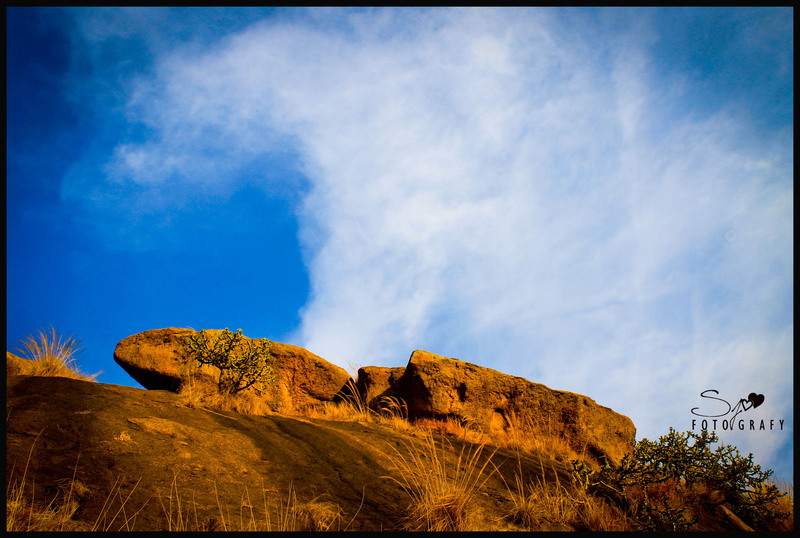 According to him, this place is known as Rangaraayana Doddi to everyone. Since this place is extremely pleasant, calm and scenic, somebody compared it with the Panchavati of Ramayana and that’s how the name came into existence. But even today, hardly anybody knows this place as Panchavati and this explained why we could not find it on Google Maps! Siddaraju even had interesting stories about the hills around and sloth bears that would come into the village from these hills during the night. There was still a good time before the sunset so we gave a try at some sort of rock climbing on this small rock hill that rose from where the water ended. There were 10-15 steps that were carved on the slopes; rest of the climbing was on the slopes of the extremely huge rock that seemed to stretch into the sky. I must agree that it was a bit risky walking, crawling and dragging ourselves along the rugged rock surface. There were hardly any grip to hold onto incase we slipped. The curved surface of the rock had eroded at most places making some treading which were the only available grips, either to walk or to crawl. (Think twice or thrice before doing this if you happen to be here, especially women n children and people suffering from fear of height). We cautiously clambered along the walls at snail’s pace to half way up the rock where there was a small platform like place. The view was nothing but glorious from here. Vastly spread lake beneath and two boats floating in it, a man-made walk way and fence along the southern bank, green fields beyond the lake. Feeling the wind high over the mountain we savored the view. It was more difficult to climb further up. So after spending some time out there, we started our decent. This looked more dangerous, at least for the vertigo suffering me. It was like walking over an egg, plainly! There were no walkways or railings or steps. It was just the curved surface that we had to crawl carefully on! One wrong step and we would be sent carting into the waters below, possibly with some skin remaining on us. After another creepy, careful slide we were back at the boat jetty. The sky seemed to be publishing that the sun set was around the corner. We were lucky to be all alone at this place and six of us got into the only two boats that were available there! The lake started to change in colors as we peddled the boat on the swaying waters. The water looked deep and blue! Stunning sunset on cards, swaying waters, and the entire lake for us! I don’t have the adjective to describe how it feels! As the dawn arrived, the scene became more and more dramatic with every passing second. 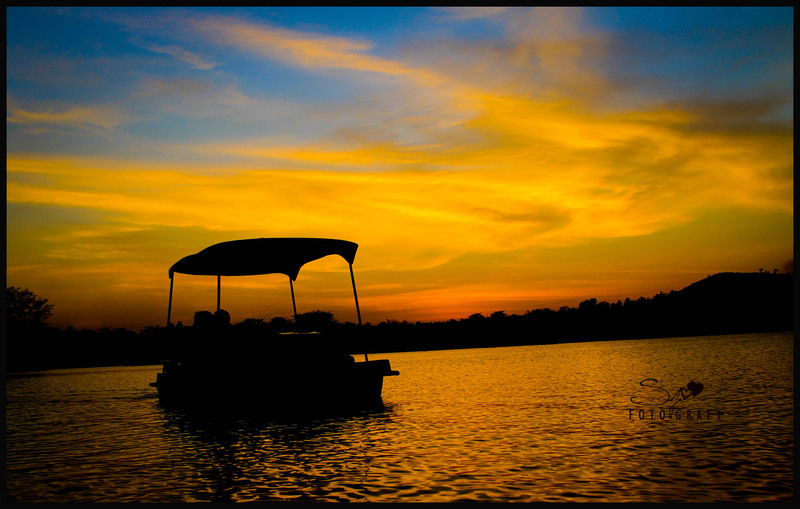 This was the first time ever I was witnessing a sunset from a boat in a lake. The bluish sky churned out colors of different hues. It was like watching an epic event unfold. There were too many birds that took rest on the rocks on the shores, some flying back to their nest and most of them quacking around. We peddled on the waters that now seemed endless. 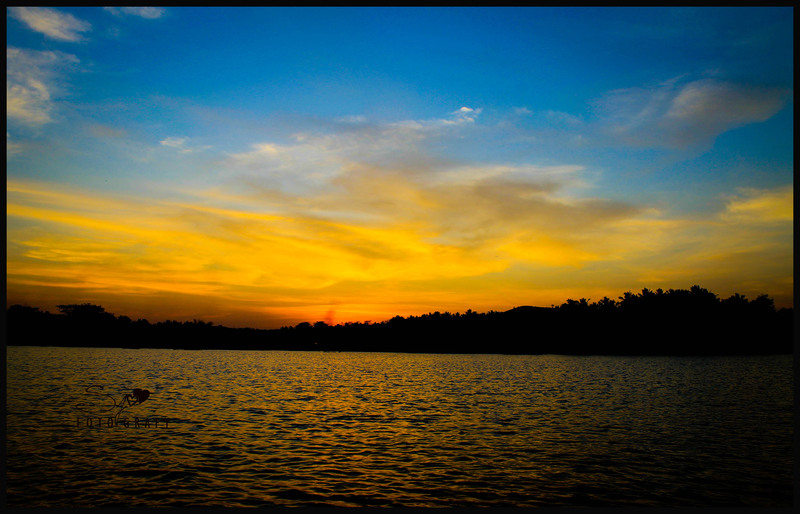 The sinking sun formed a dim reflection on the waters and the swaying wind blew as if to wipe it off. It was an evening of mixed feel. Sometimes romantic, sometimes fading, and some other times radiant! The sun set carried a thousand emotions with it, I felt! 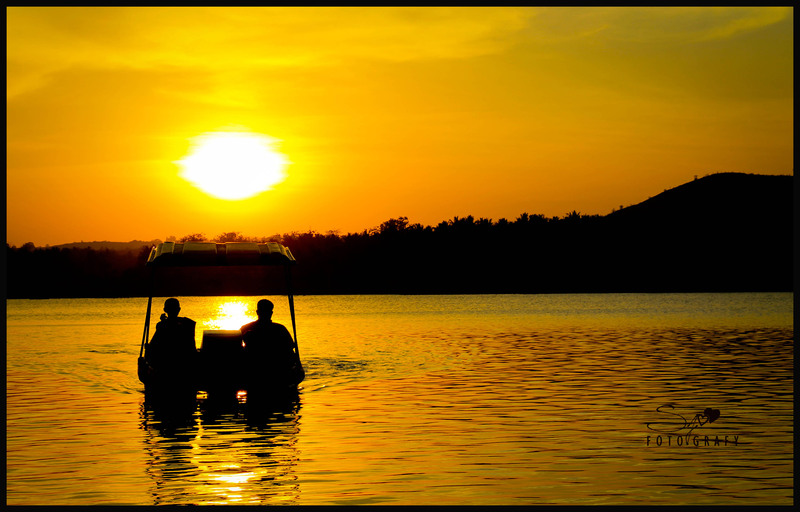 I slid back in the seat of my peddle boat, stopped peddling and stuck my gaze at the sinking sun. It was an overwhelming sense of calmness. Only the birds could be heard apart from the wind. 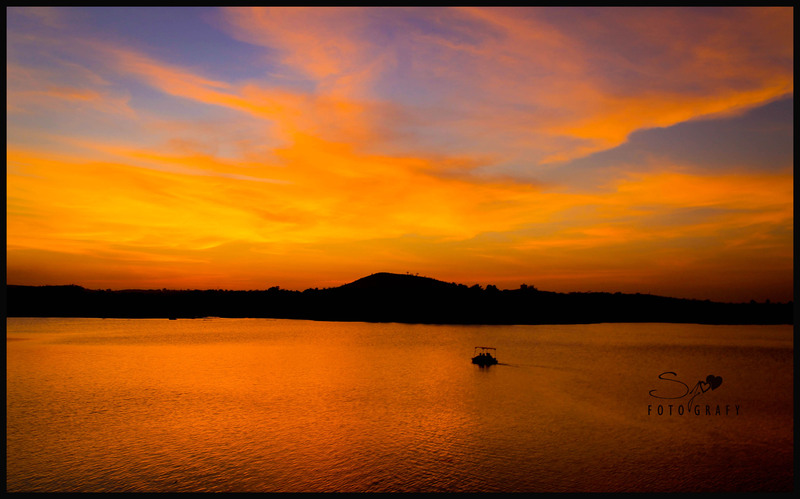 The glow of orange-red- hues were warm; Warmth that touched both skin and soul even while it was fading! 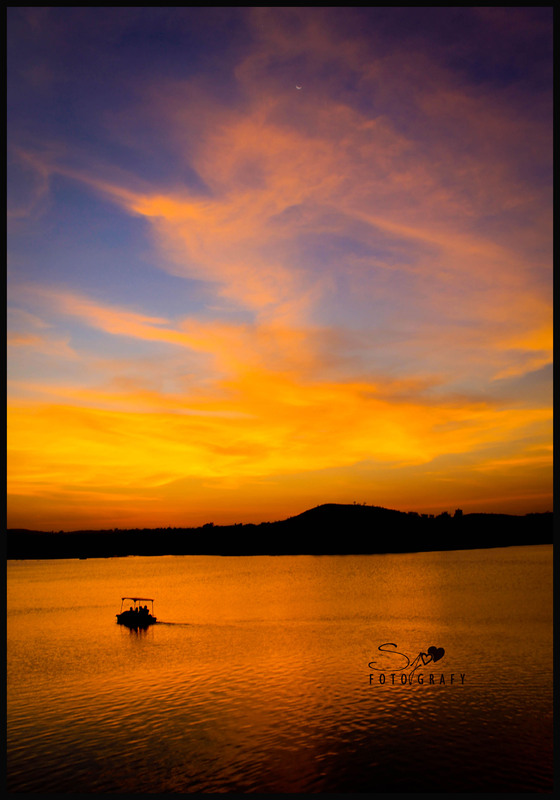 The glistening sun sank into the horizon completely splashing vivid colors into the sky which now reflected in the waters! Every color inspired a feel of rest and peacefulness. It is a delightful end for the day to hear the music of the waves and breathe in fresh air while witnessing a spectacular sun set. In few minutes the sky was covered with clouds of fantastic shapes and brilliant hues and the first star appeared alongside a faint crescent moon. In the darkening surrounding finally the day gave way to the night. It was a day that invoked a sense of composure on a breezy surrounding! Rabindranath Tagore’s verses came into my mind, “Clouds come floating into my life, no longer to carry rain or usher storm, but to add color to my sunset sky.” This one sun set had indeed added a lot of color into my sky!! Wow the narration good as well! hello, that is a cool report! it gave me exactly the information i was looking for!! Love your sunset shots! Great use of light in each of them.